"Now, if you can forgive someone for immersing himself in pictures, perhaps you will also grant that the love of books is as sacred as that of Rembrandt, indeed, I believe that the two complement each other." This section was originally just one page, but I've decided to divide it into the nine separate categories (listed below). The original page had grown too large and was taking too long to load so this restructuring was required. 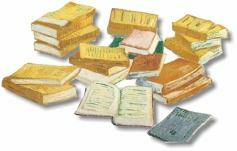 Within each of these categories I present an annotated directory of books that focus on Vincent van Gogh's life and works. 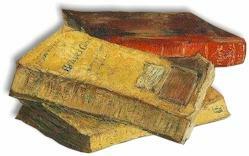 Many of the titles are directly linked to Amazon Books, an on-line book seller with an extensive--and always growing--inventory of Van Gogh-specific references. The content of the following subsections will be continually updated in order to provide the visitor with the most current information available.